This is a collection of unrelated short stories which all have a theme related to home or family. I enjoyed the title story very much. It was full of rich detail that drew me in. I also enjoyed a story called "Islands on the Moon" about a daughter and her estranged mother. Some of the other stories left me feeling like I needed the author to tie up some loose ends. I think some of the stories were meant to have a deeper meaning than what was immediately obvious to me, so a smarter reader might fall head over heels in love with them. 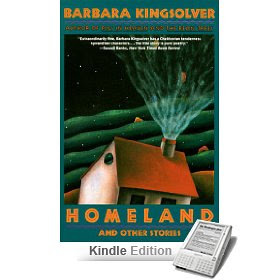 Kingsolver is one of my favorite authors. She is an incredible writer, but if you want to get acquainted with her work, I recommend The Poisonwood Bible or her series that begins with The Bean Trees.